How far will the West be pushed? For decades, Iran has embraced a strategy of carefully feeling its oats, prodding at the West, testing our mettle in inches. Now, like Germany in 1938, Iran is beginning to realize that the West will do nothing to stop it. Crippled by a pathological aversion to war, America and Britain sit by silently as Iran develops nuclear weapons, fosters terrorism in Iraq and targets Western interests for total annihilation. Iran's latest test for the West is its abduction of 15 members of the British Royal Navy. Iran feebly claims those sailors were found in Iranian waters. In truth, Iranian forces crossed into Iraqi waters to take those British sailors and marines prisoner. The abduction was no innocent mistake by the Iranians -- it was planned in advance, designed to achieve the release of five Iranian Quds Force members arrested in northern Iraq, designed to place pressure on the West more generally. Hours before the U.N. was to decide on the issue of harsher sanctions against Iran, the Iranians seized the British. Iranian President Mahmoud Ahmadinejad, who was scheduled to speak to the U.N. regarding the sanctions, cancelled his appearance. The Western response has been tepid. Prime Minister Tony Blair of Britain says British efforts to obtain the sailors' release will enter a "different phase" if current negotiations fail. That "different phase" would include releasing evidence that the Iranians had entered Iraqi territory to grab the British sailors. That "different phase" would not, however, entail expelling Iranian diplomats from Britain or contemplating military action. In other words, Britain will act miffed, but not miffed enough to secure the release of their troops. Which is precisely the course the Brits ought to take, according to the international left. Like Agamemnon, the international left is willing and eager to sacrifice countless military Iphigenias to appease radical Islamist gods. Useful idiots like former British Ambassador to Uzbekistan Craig Murray are coming out of the woodwork to blame coalition forces for Iran's hostility. "In international law the Iranian government was not out of order in detaining foreign military personnel in waters to which they have a legitimate claim," Murray told Al Jazeera. "For the Royal Navy to be interdicting shipping within the 12 mile limit of territorial seas, in a region they know full well is subject to maritime boundary dispute, is unnecessarily provocative." Loudmouth ignoramus bovine Rosie O'Donnell has likened Iran's seizure to the Gulf of Tonkin incident, implying that coalition forces led by America would use the seizure as a manufactured excuse to go after Iran. Murray and O'Donnell aren't alone. The newly minted Democratic Congress has already demonstrated its willingness to undermine American credibility with regard to Iran. Speaker of the House Nancy Pelosi, D-California, has announced, "Congress should assert itself and make it very clear that there is no previous authority for the president, any president, to go into Iran." Senate Majority Leader Harry Reid agrees: "The president does not have the authority to launch military action in Iran without first seeking congressional authorization." Meanwhile, the Democratic Congress has continued to pursue a policy of pre-emptive surrender in Iraq, emboldening both violent sectarian militias and the Iranian regime. The Democrats' proposed timetable proposes precisely the strategy that led to devastating defeat in Vietnam -- which is, of course, what the Democrats want, since they can then blame President Bush for "his" disastrous Iraq policy. Two centuries ago, several Muslim states seized American ships and sailors on the high seas, demanding tribute from the United States. For decades, the Americans complied. Then they created a navy. Under Thomas Jefferson and James Madison, America struck back, forcing Tripoli, Tunis and Algiers to sign treaties forswearing piracy at gunpoint. One century ago, Moroccan bandit Mulai Ahmed er Raisuli kidnapped supposed American citizen Ion Perdicaris. Teddy Roosevelt famously responded that he wanted "Perdicaris alive or Raisuli dead," and dispatched seven battleships and a marine detachment to Morocco. The incident ended with the safe return of Perdicaris. Today, a dramatically hostile Iranian government -- a government that has sent its soldiers across the Iraqi border to harass Iraqi and American troops, a government that supports terrorism throughout the Middle East, a government that is quickly developing nuclear weapons for use against our allies, a government that kidnaps coalition soldiers and holds them on trumped up charges -- is met with nothing but sighs of indignation and huffy posturing. 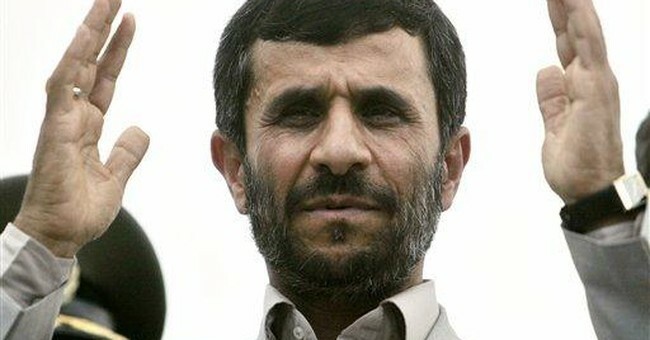 How long will it be before the West tells Ahmadinejad he has "missed the bus"? And how long after that before the West is forced to face up to the consequences of its own fecklessness?